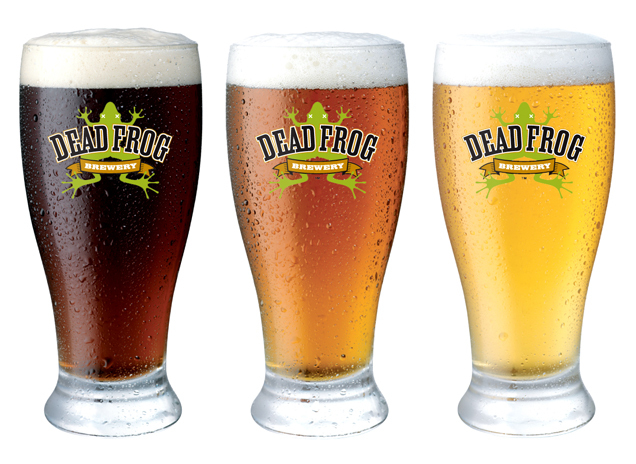 Dead Frog is back with another limited release, arriving on the heels of their Brazen IPA, Winter Beeracle and Fearless IPA. And with the exception of the Brazen, which I have yet to try, these limited releases have been quite impressive, in my opinion. Basically, they show that the spirit of craft brewing and experimentation are alive and well in yet another big Pacific Northwestern brewery. As for this latest experiment in craft brewing, the Valiant is a twist on your classic Belgian Abbey ale, relying on Belgian yeast and a lengthy fermentation process to achieve a distinctly strong and flavorful ale. 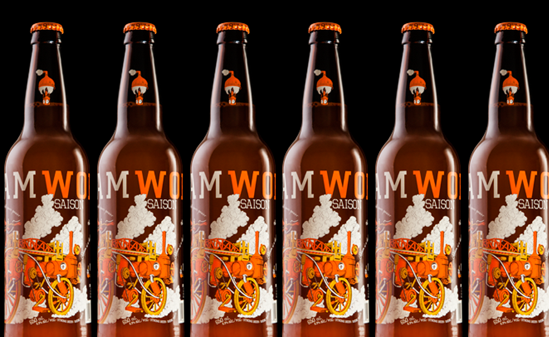 At the same time, they’ve incorporated a good dose of hops, the classic Pacific Northwestern IPA varieties of Centennial and Columbus, to achieve a strong bittering effect. The result is something that is becoming increasingly common here in the Pacific Northwest, a merger between disparate traditions that work great on their own and are… interesting when combined. Like most Belgian IPA’s I’ve had, I found this one a little odd at first, but grew to like it with each sip. In the end, it really captured the essence of a strong Belgian Ale, and the bitter finish offers enough of a compliment without getting in the way. I’m finding that there’s a certain Gulf Island brewery that is rapidly becoming known for its ability to experiment and keep it real. 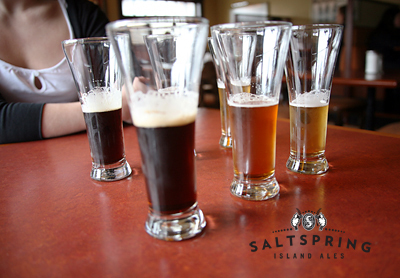 In case the title line hasn’t given it away, that brewery is Salt Spring Island Brewery! 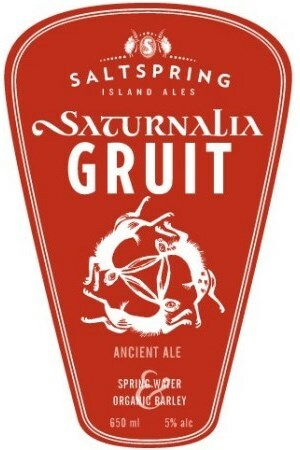 And in my most recent sampling from their wares, I came upon this, the Saturnalia Gruit, and instantly knew I had to try it. Not only is it new from this beer snob’s perspective, it is also special in that it pays tribute to an ancient and largely forgotten style of beer-making. In short, the beer is named after the Roman festival which honored the deity of Saturn, during which time gifts were given, social norms were reversed or abandoned, and people feasted and partied for days on end. To help wash down their food and establish the right kind of “festive spirit”, people drank vast quantities of beer and wine. But since ordinary social norms were put aside, beer was not considered a plebeian drink on this day. The term Gruit, meanwhile, refers to the mixture of herbs which were used in ancient times to flavor beer, as hops had not yet been discovered as a stabilizing and flavoring agent. In sum, this beer is rather interesting and substantially different than anything your modern beer drinker has ever tried. In fact, there are those who could easily mistake it for something other than beer, were they to consume it in a blind taste test. And I have to admit, the flavor wasn’t exactly something I might ordinarily go in for. However, one has to expect that in cases like these, where styles veer away from the established norm and present something truly different, and in keeping with brewing trends that are no longer in use. So I give it high marks for authenticity, and recommend it for all beer snobs are required drinking! But in the meantime, I am satisfied to sample their Saison, a tribute to the French-speaking province of Wallonia in southern Belgium where the style originated. Typically brewed in the colder, less active months of autumn, this variety of beer is generally milder and lighter than your typical Belgian ales – that is to say 7% alc/vol, as opposed to those with a heftier rating of 9% and above. And like many of its compatriot beers, Saisons tend to boast notes of fruit and spice, either the result of the specialized yeast that is used in fermentation or due to the additional of actual fruits and spices. 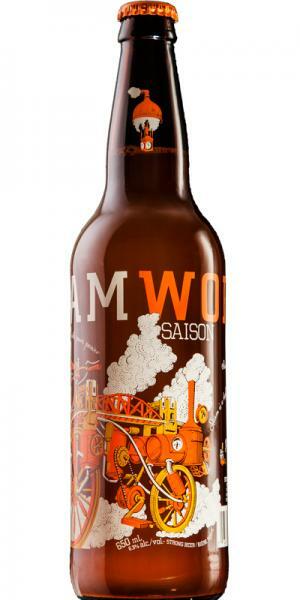 In keeping with that tradition, Steamworks’ own Saison is made using a combination of wheat and barley malt, is light and yeasty, and slightly stronger than your average fare, clocking in at a respectable 6.5% alc/vol. And I’m back, and this time, I brought a beer that is obscure even for my standards! Yes, this would a new product from the venerable Schneider Weisse brewery, an operation renowned for producing one of the greatest beers I have ever tasted! And much to my surprise, it seems they are creating new beers, things that fall outside their time-honored lineup, and even through collaborative efforts with comparatively recent craft brewers. 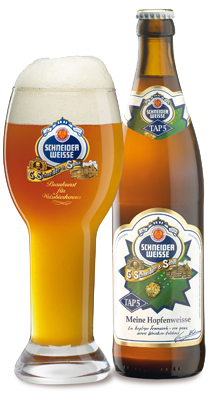 One such beer is the Hopfenweisse, a beer that was produced through the combined efforts of Schneider Weisse and the Brooklyn Brewery. And I can honestly attest it is one of the more unique varieties of beer I’ve ever tried. Though I felt myself sufficiently primed by Weisen Edel-Weisse, the drinking experience provided by this number was still packed with surprises! Playing to their strengths, and yet stepping out of their comfort zone just a little, this wheat strong ale is brewed with a combination of wheat and barley malt and is hopped in just such a way to achieve a fruity aroma and aftertaste. 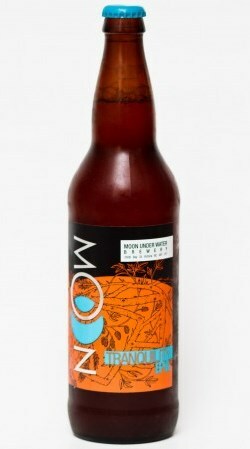 On top of that, there are notes of some rather interesting herbs and a sugary quality that is similar to barley wine. Taken together, this leads to a rather weird, interesting, and appealing kind of acquired taste! It’s quite the experience when you wander off the beaten path and find something new, yet related to the things you know and like. That’s kind of how I felt when I wandered into one of the many Liqour Plus depots in Victoria that has been known to stock many of my personal favorites, plus a respectable selection of things I have not heard of from time to time. Amongst the gems that appeared in this particular store was a new release by Saltspring Island Breweries, one which was created through a collaboration with (wait for it) Liqour Plus! Yes, it seems that in addition to selling beer, wine and spirits, this particular chain of private distributors also has a hand in producing them. And this clearly-intended-for-after-dinner-pairings-with-your-dessert beer was the fruit of their labor. 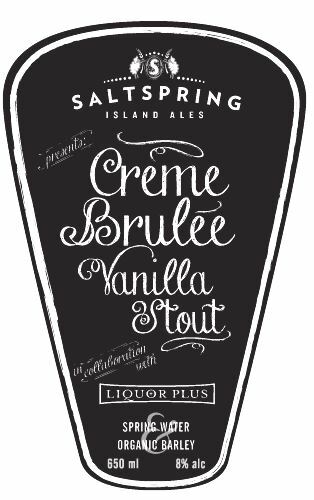 Building on what is clearly becoming a tradition amongst craft brewers who produce stouts, the Creme Brulee Vanilla incorporates lactose into the brewing process to give the beer a highly smooth, almost milk-like profile. On top of that, there’s the addition of organic vanilla beans to add a dimension to the stout flavor which makes the beer live up to its name. Basically, its creamy, smooth, slightly sweet, yet full of all the characteristics true of a dark, roasted stout beer. Rye beer is one of those rare treats that few breweries ever attempt, except those that are really adventurous or dedicated to experimentation. 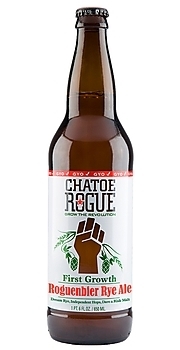 So it was little surprise when I learned that Rogue had included a rye ale in their GYO (Grow Your Own) Chatoe Rogue series, a special lineup dedicated to farmers, fermenters and brewers that uses almost exclusively homegrown ingredients. This is the second GYO beer that I’ve sampled now, the last being their Dirtoir Black Lager, which was quite the experience in itself. This one was a fine follow-up, being very much unique, experimental, and yet very true to the best traditions of craft brewing. In addition to using homegrown rye, Rogue also employed several of their own proprietary malts, hops, and a Weizen yeast, giving it a flavor that is something of a witbier, a dark ale, and a loaf of rye bread. Yes, quite the experience indeed! I look forward to sampling other beers in this lineup, provided I can find them of course. Might just be time for another road trip to Seattle! It has taken me some time, but I have managed to finally complete Moon Under Water’s new lineup, ever since the brewery underwent a change in leadership and stopped producing sessionals. Unfortunately, I have been rather remiss in taking notes and providing comprehensive reviews. And since I refuse to do reviews based solely on memory (as mine can’t be trusted anyway! ), I’ve finally managed to pick up some fresh bottles and resample them. And here’s what I thought of the Tranquility IPA, a beer without which no West Coast brewery operation would ever be complete. True to its roots, this India Pale Ale combines a strong, semi-sweet malt character with a generous dose of hops. And in what is increasingly becoming the norm with Northwestern IPAs, it combines multiple varieties of hops in order to produce a more complex hop profile.